The OnePlus One smartphone has gained quite some fans, thanks to it being a value for money proposition and today, we have come across the OnePlus OneWatch smartwatch. The OneWatch has leaked in a sketch detailing its hardware and we also have a picture of it from its website. If the sketch is indeed true, the OnePlus OneWatch will sport an OLED display with Saphire glass on top. The watchface will have Titanium borders and there’s a button to configure the smartwatch, similar to what we see on traditional watches. The smartwatch features a leather band and there’s a curved battery inside of it. The OneWatch will come with Qi wireless charging support. The smartwatch features a round watch-face, much to our liking, similar to the Moto 360 smartwatch. We don’t know if it’ll come with Android Wear or OnePlus’ own solution on top of Android. Either ways, the OnePlus OneWatch is the smartwatch to lookout for, considering OnePlus has made a reputation of bringing high-end products at great prices. 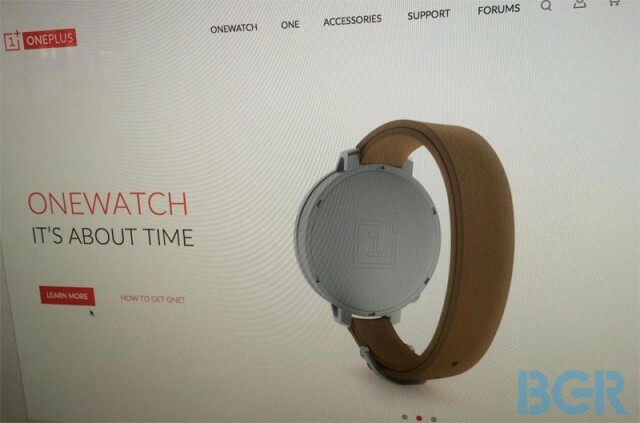 The picture taken of the OneWatch’s website suggests the launch isn’t very far away. We are surely awaiting the OneWatch’s introduction and hopefully, we won’t have to wait for invites this time.